Tropical Rains for Mexico? Florida? 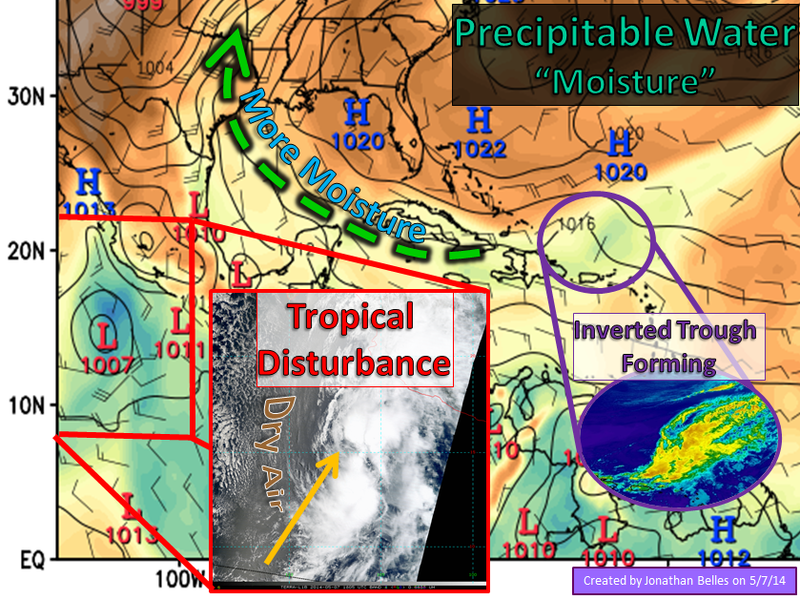 There are two areas of interest tonight in the tropics, although both are not necessarily tropical. We continue to look at the tropical disturbance, otherwise known as Invest 90-E, off the coast of Mexico. We also have an area of disturbed weather north of the Lesser Antilles that may bring south Florida’s next large rain chance. Moving from west to east, the tropical disturbance off the Mexican coast looks to be on the way toward weakening. This storm was spawned on the warm water of the eastern East Pacific, but it will be torn apart in the days to come by the jet stream lurking just to its north. Wind shear, differential winds with height, is taking much of the thunderstorm activity off toward the north of this system’s center. Drier air also lurks off to the west, and time says that will eventually work in toward the center as well. Chances for development will be falling very soon if not for the reasons listed before, but also because the Mexican coastline lurks ahead in a couple days time. GFS continues to bring 1-3″ or 25-76 mm of rain to the Mexican coastline. Some of this moisture may make it to the hill country of Texas along with moisture incoming from the Gulf of Mexico on the back side of high pressure. The second system I’m watching is north of Puerto Rico. It rests along an old frontal boundary that is falling apart. The models, and NWS Miami, continue to think this area of lower pressure may move northwestward as an inverted trough (a trough that is upside down in respect to what most of the states see). This area seems to be dissipating, but the GFS seems stubborn enough that it wants to rebuild that area of low pressure over the weekend. IF that happens it would move through the Bahamas with advancing moisture with its closes approach to Florida during the middle of next week. Right now my current thinking is that Florida will be sandwiched between a cold front to the north, which will steer the low pressure area away, and the wet low pressure system. In this case it looks like we will end up on the dry side of this system. This looks to be mid-level feature. Rainfall on this path would be limited across most of Florida. Any deviation to the west would bring more rainfall to Florida and Cuba. Again, this will be non-tropical! Moisture is increasing across Florida on the back side of high pressure tonight, and will continue to do so through this weekend. Mother’s Day weekend should feature a few showers, but chances should remain low. It will feel sticky to most south of Interstate-10. No severe weather anticipated. Posted on Wednesday, May 7th, 2014, in Florida Weather, Tropical Weather. Bookmark the permalink. Leave a comment.